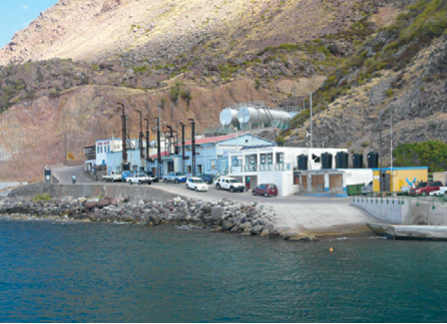 Saba’s entire electric supply depends on a 4 MW diesel generator built near sea level. The island of Saba faces fundamental challenges in common with other Caribbean islands. These include the challenge of putting its economy on a sustainable development path in the face of an over-dependency on food and fuel imports, the latter of which are dominantly for the purposes of electricity generation on the island. Security of supply. There is a limited capacity for interconnection with the mainland and diversification of energy sources, which creates a serious energy security issue across the Caribbean islands. Quality and reliability. Operational constraints affect the quality and reliability of electricity. Isolated systems like Saba’s electricity grid must constantly monitor demand and produce exactly the quantity of electricity required by end-users. This constrains economic development and impacts the quality of life on Saba. High costs. Expenditure on fuel imports for electricity generation is approximately 6.5% of Saba’s total GDP. Spikes in fuel prices result in economic stress because Saba lacks any economy of scale to finance the volatility. Technical barriers. Difficulties in overcoming barriers like adequate equipment maintenance in the harsh environment can hamper the deployment of renewable energy technologies. Exposure to natural disasters. The largest physical risks for any infrastructure on the island are extreme natural events. All energy infrastructure built on the island must be able to resist Category 4 hurricanes. Current electricity supply depends entirely on one diesel power plant located on the coast by the harbor. This location close to sea level increases its exposure to natural disasters, such as hurricanes, flooding, big waves and extreme weather. Fifty per cent of the cost of electricity is related to fossil fuels and lubricants, for which consumers pay a subsidized rate 35% below the cost of production. The other 50% corresponds to operational costs, including maintenance, capital costs (depreciation, amortisation and interest), overheads and administration. The Government of Saba has made the decision to transform the island to 100% sustainable energy and eventually eliminate dependence on fossil-fuel-generated electricity. The island’s new energy policy is defined by the ‘Social development plan 2014–2020’ and is further detailed in Saba’s energy sector strategy. Intermediate targets are 20% renewable electricity by 2017 and 40% by 2020. Saba’s energy policy is the result of a robust process of technical studies, analysis, stakeholder consultation and consensus building. Equitable access to and quality of energy for all sectors of society, particularly the poor, is an overarching goal of the policy. The implementation of Saba’s energy policy has so far been successful. Two energy infrastructure projects are being implemented thanks to a private–public partnership (PPP) between the Dutch Government and the local Saba Electric Company NV (SEC). This case study examines Saba’s journey towards 100% sustainable energy, including its historical context, an overview of the electricity sector, policy objectives, budget and replicability. Four important lessons from the study that can assist other Caribbean islands in their transition towards sustainable energy supply are included below. Download the full text from the right-hand column or via the link provided under further resources. The implementation of Saba’s energy policy provides four important lessons that can assist other Caribbean islands in their transition towards sustainable energy supply. Financing the transition: Going from a fossil-fuel-based system to renewable energy sources is a capital intensive commitment, especially for islands. Their small economies and the difficulties they face in accessing long-term financing at good rates makes it very difficult to initiate a sustainable energy supply policy. Private–public partnerships (PPPs) like the one established between the Dutch Government and Saba Electric Company NV (SEC) are an excellent way to finance the energy transition at the local level. Evaluation of technical options: There is not much room to pilot new or advanced technical options on small islands like Saba. SEC has decided to go for tested, off-the-shelf solutions rather than for ‘innovative’ or ‘promising’ solutions. This decision is supported by the Government of Saba. Saba’s small size and remoteness make obtaining any necessary technical support complicated and lengthy. If something goes wrong with the energy infrastructure, it may take days for a technical expert to reach the island. Obtaining spare parts is also a long process as they must be shipped from Sint Maarten or from further away. The more innovative and new a technical option is, the longer it will take and more expensive it will be to solve problems during regular operation. Implementing best practices: In the initial evaluations, Saba equally considered wind and solar energy as best options for the island. Both are well known and available with off-the-shelf technologies. However, after a deeper assessment of the advantages and risks, the Government of Saba and SEC have decided to give priority to the construction of PV systems. Wind energy is unlikely to be adopted because of the risk of severe infrastructure damage when hurricanes hit the island. Wind energy would have similar chances compared to PV systems if technology breakthroughs to protect mills (e.g. retractable masts) became commercially cost-effective and available off the shelf worldwide. This is not yet the case. Choosing a renewable energy business model: A lengthy discussion over different business models for the supply of electricity took place on Saba over the past few years. While the choice of decentralised net-metering had some appealing features, it was concluded that, for the size of Saba, a more conventional business model offered more guarantees than a prosumers model. Because of the size of Saba’s electricity system, SEC would quickly de-capitalise and not be able to operate, maintain or offer reliability to the system if only few customers decided to produce their energy and sell their surplus to the grid. Current legislation allows for self-production of electricity and for injecting surplus into the grid; however, no tariff has been established as remuneration for injecting surplus energy into the grid. This case study was prepared for the Low Emissions Development (LEDS) Global Partnership Working Group on Sub-National Integration. For further information, please contact: Sergio Ugarte, SQ Consult B.V. (s.ugarte@sqconsult. com); Menno van der Velde, senior policy advisor of the Government of Saba (menno@sabagov.nl) or Scott A. Muller, co-chair Subnational Integration Working Group (smuller@sig-gis.com). The Low Emission Development Strategies Global Partnership links practitioners and policymakers through a network of three dynamic regional platforms and six crosscutting working groups . This report brings together case studies that highlight how CBA projects have designed and implementated projects to build the adaptive capacities of local communities in SIDS.